Welcome back to the curious and pragmatic side of the science presented by G&B! Today we want to discuss about something practical as well as essential: how important is our Immune System in relation to the pregnancy process? Most of the people think about the immune system as the defense of our body from external pathogens (bacteria, virus, etc. ), and let me tell them/you that this is completely right. But sometimes, as it happens with justice, some innocents are declared guilty, and vice versa. And this is exactly what happens with the autoimmune diseases (such as Coeliac disease or Chron's disease, e.g. ), where a small problem on the recognition of the cell surface markers or on the control and regulation of the immune reaction can make our own cells look dangerous. After this small introduction about autoimmunity, now think that inside your own body a new individual is growing, developing, taking some of your nutrients and making you ask for blueberry-jam cheese-cake with no apparent reason. And also, the cells of this new individual are different from your cells, because it is a mix of two different genomes in a very complicate process. Has the immune system nothing to say about that? Indeed it has, but fortunately nature is wise, and the tissue connecting mother and baby is not allowing the mother's immune system to have free access. But (there is always a but...), there is something that can be recognized across the border: the Rh factor. As we slightly described in one of our posts (Bloody confusion!) Rh is a human blood group system, like ABO, that is defined as positive or negative depending on the presence or absence of one specific protein: the D antigen. As it happens with the blood donation, an Rh positive person cannot donate to a Rh negative person, because the immune system will react against this unknown protein (the D antigen). 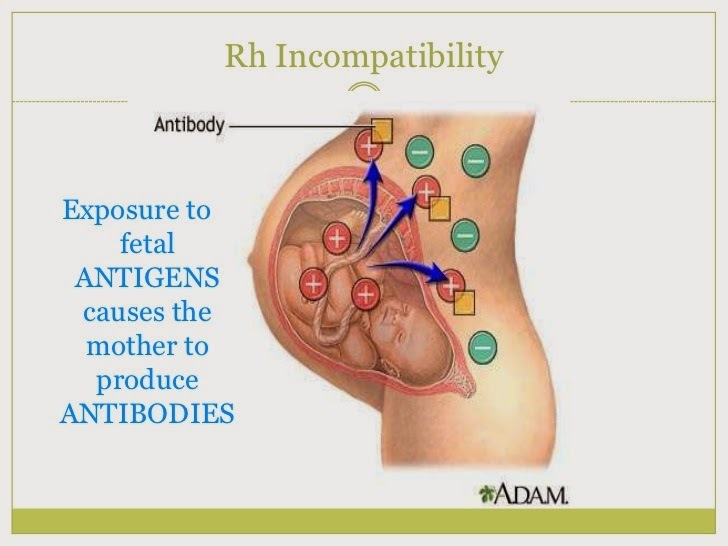 So if a Rh negative woman gets pregnant from a Rh positive man, the baby can also be Rh positive (50% of probability), and even if during pregnancy nothing will happen for the baby, any blood contact during birth can activate the mother's immune system. This reaction is named isoimmunization, and if the woman decides to have another baby, her immune system will be prepared against the D antigen and can affect the second baby if he/she is again Rh positive. The solution: anti-D immunoglobulin injection during the 28th week of pregnancy, the three days after birth and also if there is any bleeding during pregnancy. No worries, no danger, and go-ahead for a new human being. Life and nature, as justice, have their small defects. But doctors, as good judges and prosecutors, make the difference. More is coming about immune system next!